Hi, everyone! 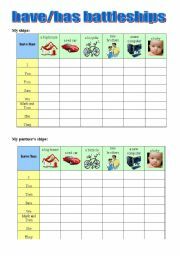 It s great to be here with you and share:) Enjoy my printables and let me know if you have any comments! 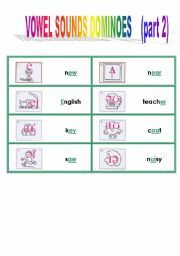 The have/has battleships communicative game for beginners and elementary students. Practises verb have/has (have got/has got) in their affirmative form or questions and short answers and gives even very low level students opportunity to speak :) Can be adapted. Instructions included. Enjoy! 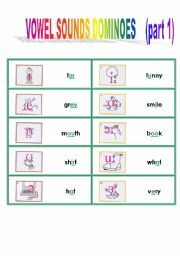 Simple reading with question words and present simple + - ? 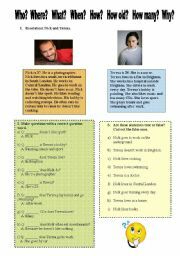 A very easy reading about Nick and Teresa´s lives accompanied by two exercises: 1.completing questions with question words, 2.true/false sentences. 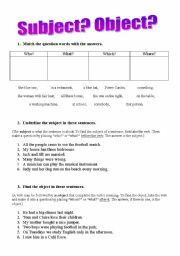 The text can be used as a springboard for introducing/further practice of present simple affirmative, negative and question forms. Hobbies and things they like are mentioned as well. Enjoy! First of two activity cards. Cut the dominoes and shuffle them. Students work in pairs to match the vowel sounds with the correct words. 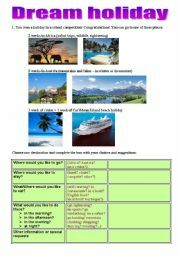 Quite challenging, but fun and good for revision!Full teacher´s notes and answer key provided. You can adapt it according to your students´ needs. Three activities to practise finding the subject and object in a sentence with some very useful tips for students. Second of two activity cards. Cut the dominoes and shuffle them. Students work in pairs to match the vowel sounds with the correct words. Quite challenging, but fun and good for revision!Full teacher´s notes and answer key provided. You can adapt it according to your students´ needs. 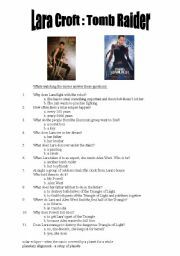 While watching "Lara Croft: Tomb Raider" (part 1) movie, SS complete the questionnaire which checks their comprehension.